Make Larrabee Manor your permanent sanctuary or pied-a-terre in the heart of West Hollywood. Enjoy the community pool and an expansive rooftop deck with views of the Los Angeles skyline. This unit offers one of the coveted balconies, laminate wood flooring, smooth ceilings, central ductless A/C and heat. A corner condo it shares only one common wall with a neighboring unit. Living area offers a sunny, peaceful view of the interior courtyard. Kitchen has new cabinets, countertops and stainless steel appliances. Ample storage in the large, private bedroom and added storage in garage. Bathroom has contemporary tile and high-end fixtures. The low HOA fee includes pool, dog run, rooftop deck, DirecTV, high-speed internet, trash removal and water. One assigned parking spot and guest parking. Walking distance to world famous shopping, dining and nightlife. 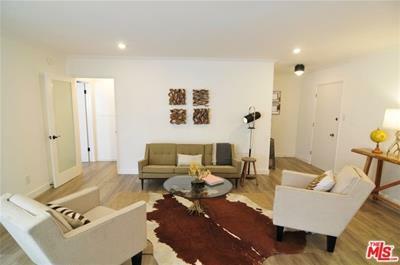 Rare opportunity to own a remodeled condo with so many amenities and such a low HOA in West Hollywood.